40' Dual-Lane Tropical Slip-N-Slide | FroggyHops.com Minneapolis MN. Setup Area: For your children's safety, we require a 6 foot clearance around the entrance and exit & a 6 foot clearance from any overhead lines. Turn your backyard into a tropical paradise with this 40 foot long dual-lane Slip-n-Slide! Kids (and adults) will be flying through these sets of palm trees for hours before they are ready for a break! 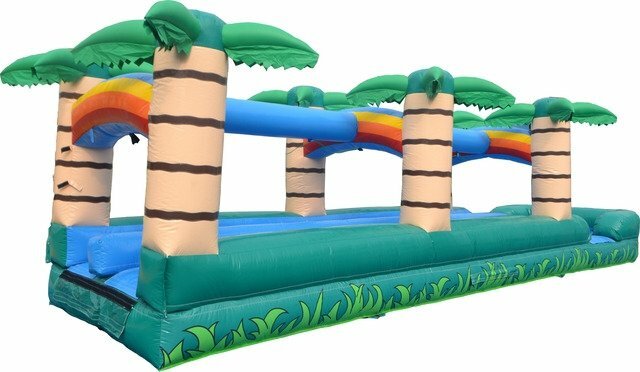 This inflatable features a playful tropical design that fits any themed water party! To play, two participants stand back and prepare for the competition. Upon the signal, the participants can run and dive into their own lane and quickly fly superman-style through the slide to the splash-pad pool at the end! There are inflatable side walls surrounding the inflatable to contain the most ambitious kids and keep them from falling out. There is also an inflatable dividing wall down the middle that keeps participants from bumping into each other during the race. Soaring above the sliders, are six 10 foot tall palm trees that are connected by the exclusive Stays-Wet Sprinkling System. 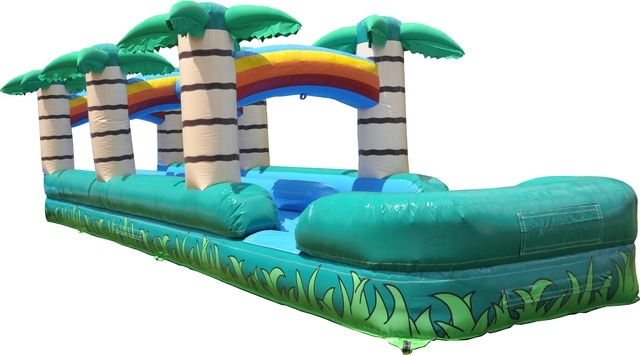 The Renter's garden hose connects directly into this inflatable and a friendly waterfall is created down the sliding area, keeping the slide fast, fun, and easy-on-the-skin! The slide is covered in a non-wax slippery slide surface that ensures the participants have a quick and smooth glide down! After daring the race, kiddos land together in the splash pad pool area. This pool area has an inflatable mattress on the bottom that ensures a soft landing for the participants. Water can accumilate just a few inches in this pool before draining out, which keeps the splashes fun and entertaining for all ages! Riders can easily exit either side of the 40' Dual-Lane Tropical Slip-n-Slide to line back up and try it again!